Come experience Atlanta in a completely unique way! Cruise through filming sites from the Furious 7 and The Boss to The Walking Dead, Stranger Things, Captain America: Civil War, Jumanji, Game Night and everything in between. 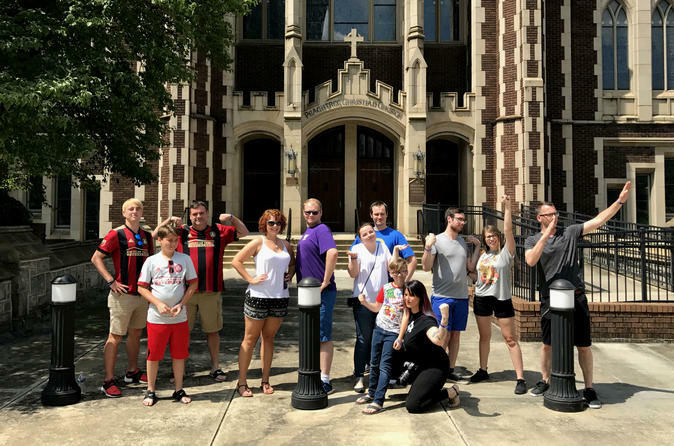 Your Atlanta Movie Tour’s Insider has been on the sets of some of your favorites and will take you into their world for 3 hours of behind the scenes stories, filming locations and interactive trivia. Hop on one of our beautiful buses in Castleberry Hill, named one of the tour Art’s Districts in the country, and begin your tour to more than 40 film and television locations. Your Insider guide, a seasoned actor, will offer behind the scene stories about the filming throughout Atlanta. Atlanta is home to many productions including Spiderman: Homecoming, The Hunger Games: Catching Fire, Driving Miss Daisy, Stranger Things, Ride Along, Rampage and more. Learn about the history of film in Atlanta, where more than 700 movies and 30 television shows have been shot since 1972. Drive through the tank scene from The Walking Dead and stand under where Meryl was handcuffed on the rooftop. Explore the Capitol’s Tribute Center from The Hunger Games. Checkout the storefront that acted as The Korean Church of Asgard from Spiderman: Homecoming. See iconic sets from Stranger Things and Black Panther. Your 3 hour bus tour is filled with movie and television clips, trivia, prizes, tons of set locations, and exclusive stories with your guide from set all from your comfortable seat in the middle of all the action. Our locals say that “this was the most wonderful and unique Atlanta experience we have ever had. Thank you for showing us OUR Atlanta”. Come be an Insider with us!